How does Curiosity compare to NASA's other roving Martian robots? The Agency has placed a total of four robotic rovers on the Red Planet. The first, Sojourner, touched down in 1997. Twins Spirit and Opportunity came next, followed lastly by Curiosity, which landed via skycrane last August. 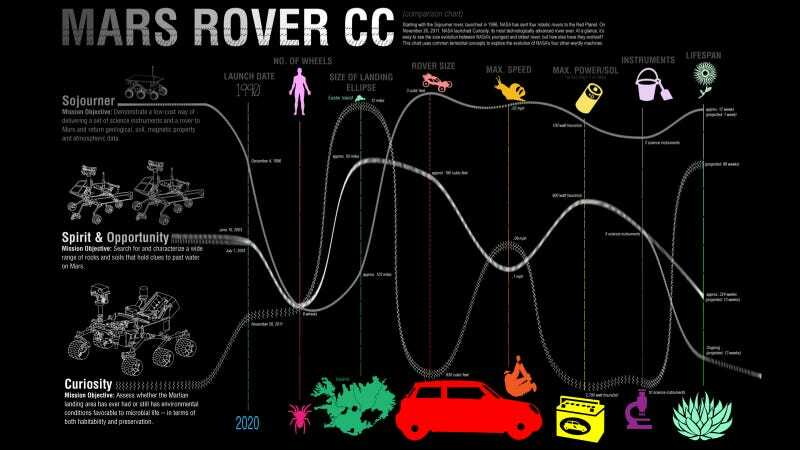 Curiosity is obviously the biggest, and the most scientifically capable, rover NASA's ever launched, but how else does it differ from its forbears? This comparison chart, recently released by JPL Infographics, uses relatable concepts (like the landspeed of a sloth!) to compare and contrast NASA's four, six-wheeled Martian wanderers. Check out more awesome space visualizations at the recently launched JPL Infographics.